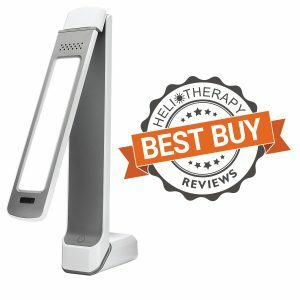 The Aura DayLight lamp is an excellent light, which almost lives up to the expectation of being the perfect light therapy device. There are only a few minor issues with this lamp and a lot of benefits; being able to adjust and customize the lux and timer settings make the lamp extremely versatile. The price runs a bit high, but its many positive reviews and excellent customer service make the amount worth paying in my opinion. CLINICAL STRENGTH- 10,000 Lux of Bright Light to help beat the Winter Blues, Circadian Sleep Disorders, Shift Work Adjustment, Jet Lag and Low Energy –THIS LAMP IS DESIGNED FOR USE IN THE USA ONLY. IT WILL NOT WORK ON ANY OTHER VOLTAGE. ETL SAFETY TESTED AND FCC CERTIFIED- Don’t take a chance with your health. 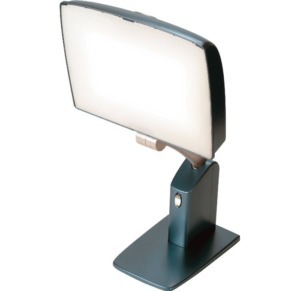 The Aura Daylight Light Therapy Lamp is ETL and FCC certified to ensure the safety of this device. 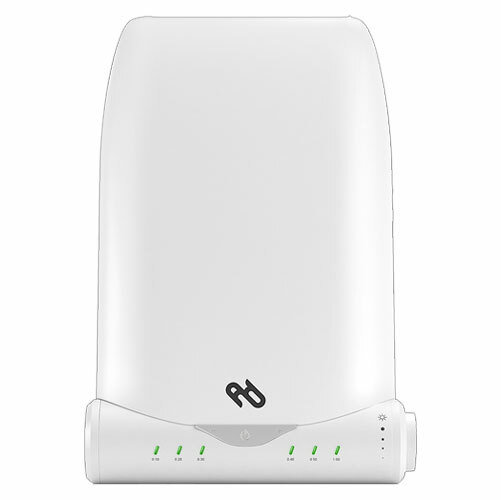 The Aura BL40 is also certified as 100% UV FREE. 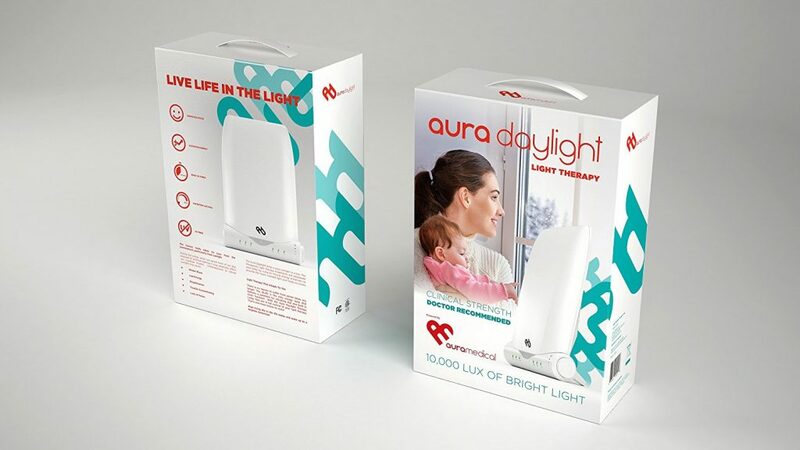 The DayLight lamp is made by Aura Medical, founded in 2013. 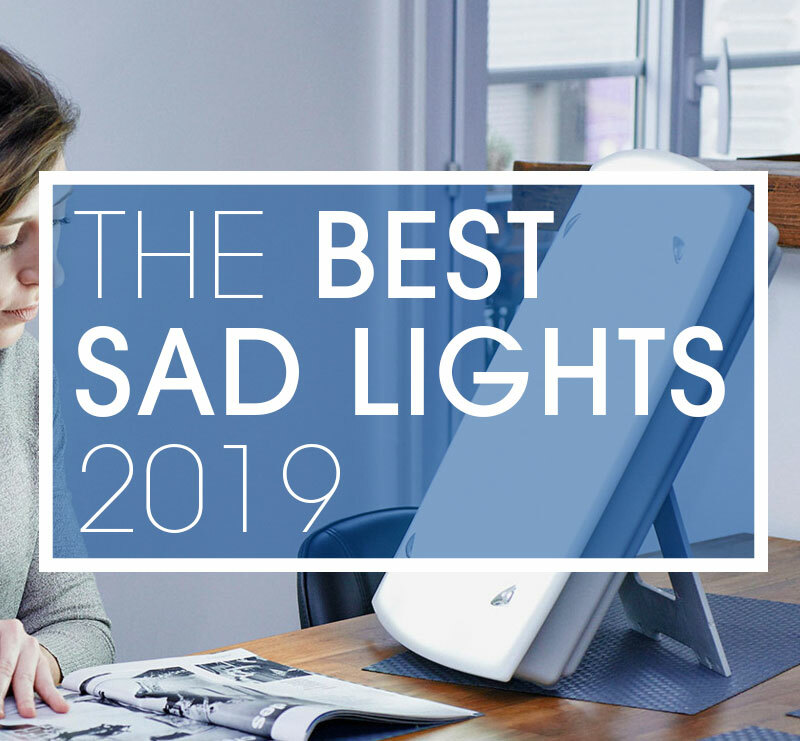 Their aim was to create the perfect light therapy device for seasonal affective disorder as well as non-seasonal depression. This is the only lamp they have on the market, and their only other product is a nebulizer. The DayLight lamp is unique in that there is no border around the light face. The lamp is basically set right into the base, so the light doesn’t appear to be boxed in. It blends naturally into whatever space you chose to use it. This means that the lamp is a bit thicker and larger than other lamps in this price range. The controls are simple, including one button with separate areas to set the timer, and a knob on the right side of the unit that controls brightness and the corresponding lux output. The light face is about the size of a piece of paper. The unique design elements of this lamp make it stand out from the pack. The packaging is pleasing and the manual is informative and provides excellent instructions. Straight out of the box, the lamp is thicker than I would have thought considering the pictures online. The stand is tucked against the back of the lamp, to begin with, and to have the lamp sit upright you must pull the stand down and click it into place. It takes considerable effort to do this, and I was very much afraid of breaking the stand. The plastic hinge is very stiff and I felt that if I put any more pressure on it, it would break. But this wasn’t the case – it clicks into place once it reaches the appropriate angle and is fairly steady. After getting the stand worked out, the cord can be attached to the lamp and you’re ready to go. The DayLight lamp is on the larger side, meaning fitting in onto a cluttered desk is a bit of a challenge. While this light is bright, the increased surface area of the light diffuses a little better than similar lamps, making the lamp easier to look at. 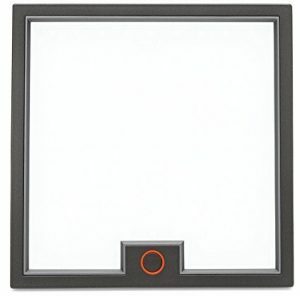 The unit itself is one piece with a detachable cord. 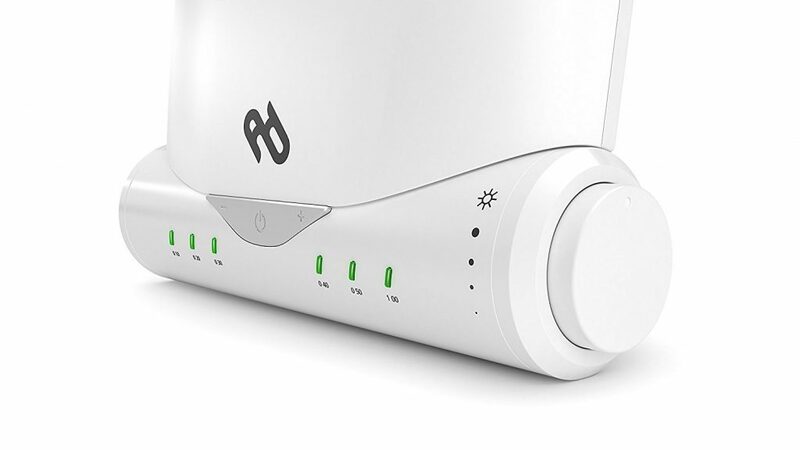 The power button on the front of the unit also adjusts the timer depending on where you press. Note that the very bottom of the button powers the unit on; despite the size of the button, the area that actually works is fairly small. This is a minor complaint and the lamp worked consistently after I figured this out. To each side of the power button are ‘+’ and ‘-‘ sign. The timer is set at 10-minute intervals between 10 and 60 minutes, and these buttons increase and decrease that setting. There doesn’t seem to be a way to leave the lamp on longer than 60 minutes. Aura recommends sitting between 6 to 12 inches from the light to get the desired effect. At the highest setting, the lamp puts out 10,000 lux at about 8 inches. The headlining feature of this lamp is the lux adjustment knob. Unique to this lamp, you can adjust the brightness and lux output using this special knob on the right side of the base of the lamp. The lowest setting is 3,500 lux and it continues to increase from there until you reach 10k lux at the top of the knob. Aura explains the implementation of this device as a way to prevent symptoms that people often complain of during therapy sessions – jitters, headaches, and nausea. This feature encourages a slow exposure to the light so that these are eliminated. This is definitely useful for those who have never tried light therapy before. The face of the lamp tilts up to a 70 or 85-degree angle, making using it simpler from whatever angle you set it. The lamp can be mounted on a wall as well. The bulbs for this particular lamp are fluorescent and expensive to replace, about $25 a bulb. However, the lamp unit has a two-year warranty with no questions asked. 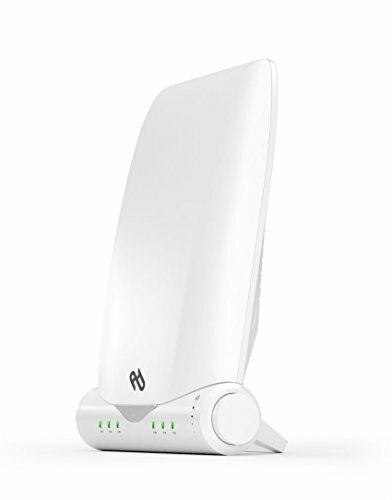 Aura will replace the lamp at no extra cost if it is faulty or fails for any reason in those two years.